Studex Plus 3mm and 4mm star shaped hypoallergenic surgical steel stud earrings with matching butterfly backs. 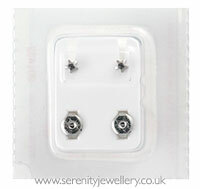 These are piercing earrings with thicker 1.2mm gauge posts in sealed sterile packaging.Piercing earrings are great for keeping your piercings open and the butterfly backs are more secure. Good quality, amazing service and fast delivery. Will shop here again Thanks a lot! The stems of these earrings are absolutely massive in thickness. I attempted to insert one and it drew blood from a piercing I have had since childhood and use very often with other earrings, now I am in pain and cannot wear earrings for a while. The thickness of the stems should be expressly stated in the product description. Very disappointed, would not order again from you. I love this. I keep them in 24/7 with no discomfort or irritation at all. Great little studs. Perfect for sensitive ears. Bought these for my 1 year old,they are the perfect size for her little ears...no negative reaction whatsover,highly recommend. Really happy with these, studs are secure on the back great product. 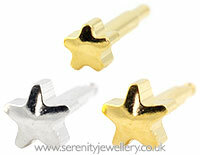 These are lovely, but I find the star shape means that it hurts to take them out (because the rays dig into my fingers). And that means I am put off wearing them at all. It may not be a big deal for you, though, if you don't take them out and put them in often. Fab product would order again . Havent had ear rings in for a while but went in easily .